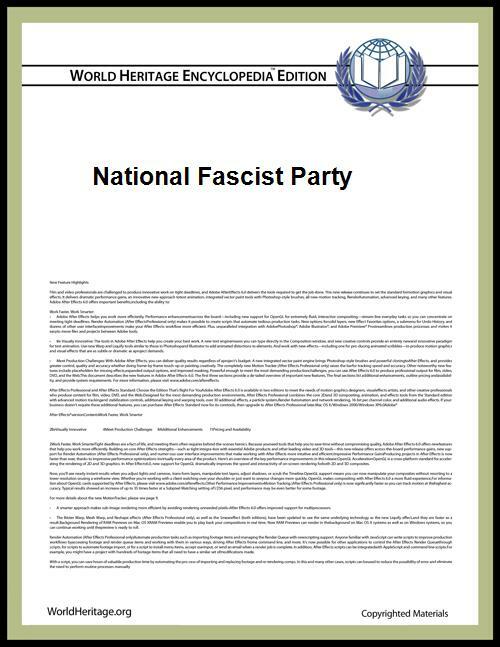 The National Fascist Party (Partito Nazionale Fascista, PNF) was an Italian political party, created by Benito Mussolini as the political expression of fascism (previously represented by groups known as Fasci; see also Italian Fascism). The party ruled Italy from 1922 to 1943. Benito Mussolini, leader of the PNF. Founded in Rome on 9 November 1921, it marked the transformation of the paramilitary Fasci Italiani di Combattimento into a more coherent political group (the Fasci di Combattimento had been founded by Mussolini in Milan's Piazza San Sepolcro, on 23 March 1919). The PNF was instrumental in directing and popularizing support for Mussolini's ideology. In the early years, groups within the PNF called blackshirts built a base of power by violently attacking socialists and their institutions in the rural Po Valley, thereby gaining the support of landowners. Compared to its predecessor, the PNF abandoned republicanism to turn decisively towards the right-wing of the political spectrum. The PNF was the main agent of an attempted coup d'état on 28 October 1922, the March on Rome. Even though the coup failed in giving power directly to the PNF, it nonetheless resulted in a parallel agreement between Mussolini and King Victor Emmanuel III that made Mussolini the head of the Italian government. On 15 December the Grand Council of Fascism was founded; it was the supreme organ of the PNF. After a drastic modification of electoral legislation (the Acerbo Law), the PNF clearly won the highly controversial elections of April 1924. In early 1925, Mussolini dropped all pretense of democracy and set up a total dictatorship. From that point onward, the PNF was effectively the only legally permitted party in the country. This status was formalized by a law passed in 1928 and Italy remained a one-party state until the end of the Fascist regime in 1943. The new laws were strongly criticized by the leader of the Socialist Party Giacomo Matteotti during his speech in Parliament; a few days later Matteotti was kidnapped and killed by fascist blackshirts. After taking sole power, the Fascist regime began to impose the Fascist ideology and its symbolism throughout the country. Party membership in the PNF became necessary to seek employment or gain government assistance. The fasces adorned public buildings, Fascist mottos and symbols were displayed in art, and a personality cult was created around Mussolini as the nation's saviour called "Il Duce", "The Leader". The Italian parliament was replaced in duties by the Chamber of Fasci and Corporations, solely filled with PNF members. The PNF promoted Italian imperialism in Africa and staunchly promoted racial segregation and white supremacy of Italian settlers in the colonies. In 1930 came the Youth Fasces of Combat. The 1930s were characterized by the secretary Opera Nazionale Balilla (ONB) under the direct control of the PNF and the Youth Fasces that were dissolved and merged into the new Gioventù Italiana del Littorio (GIL). On 27 May 1933, party membership was declared a basic requirement for the contestation of public office; on 9 March 1937 it became mandatory if you want access to any public office and from 3 June 1938 those who did not join the party could not work. In 1939, Ettore Muti replaced Starace at the helm of the party, a fact that testifies to the increasing influence of Galeazzo Ciano, the Minister of Foreign Affairs and son-in-law of Mussolini. On 10 June 1940, from the balcony of Palazzo Venezia, Benito Mussolini announced the entry of Italy into World War II on the side of Hitler's Germany. On 25 July 1943 the Grand Council of Fascism, following a request from Dino Grandi due to the failure of the war, overthrew Mussolini by asking the king to resume his full authority in officially removing Mussolini as Prime Minister, which he did. 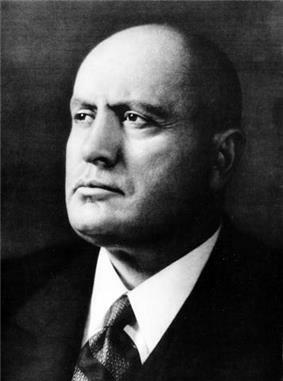 Mussolini was imprisoned; however, the Fascists immediately collapsed and the party was officially banned by Pietro Badoglio's government on 27 July. After the Nazi-engineered Gran Sasso raid liberated Mussolini in September, the PNF was revived as the Republican Fascist Party (Partito Fascista Repubblicano - PFR; September 13), as the single party of the Northern and Nazi-protected Italian Social Republic (the Salò Republic). Its secretary was Alessandro Pavolini. The PFR did not outlast Mussolini's execution and the disappearance of the Salò state in April 1945. Minor party in coalition National Bloc. Major party in coalition National Bloc. The only party admitted in the Italian Parliament. Eagle clutching a fasces, a common symbol of Italian Fascism, regularly used on uniforms and caps. Party emblem of the National Fascist Party. Flag of the National Fascist Party. Anthem of the National Fascist Party.